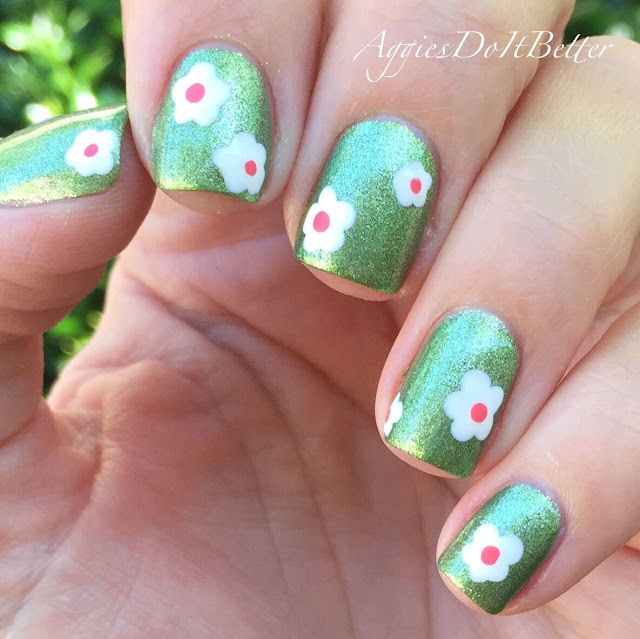 Aggies Do It Better: Lush Grass bubble bar plus matching nail art featuring Zoya! 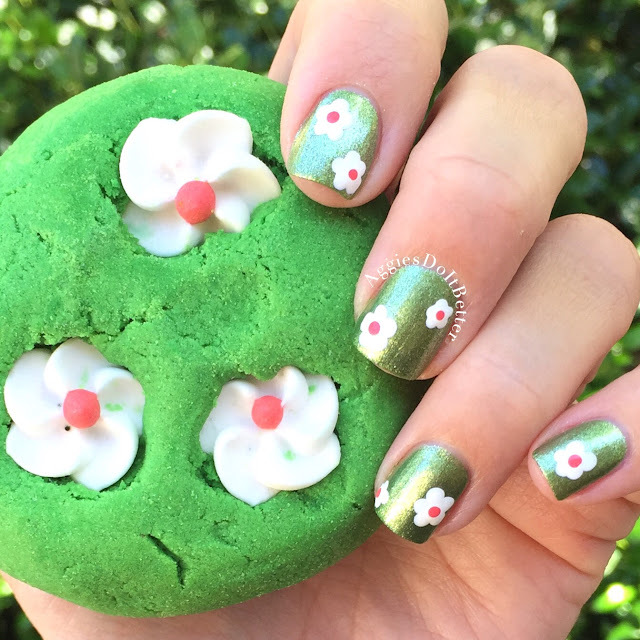 Lush Grass bubble bar plus matching nail art featuring Zoya! Hello! Life sure got busy last week-I decided to do a bunch of batch/bulk cooking so I was in the kitchen all day every day. I have a lot of blogs to catch up on! 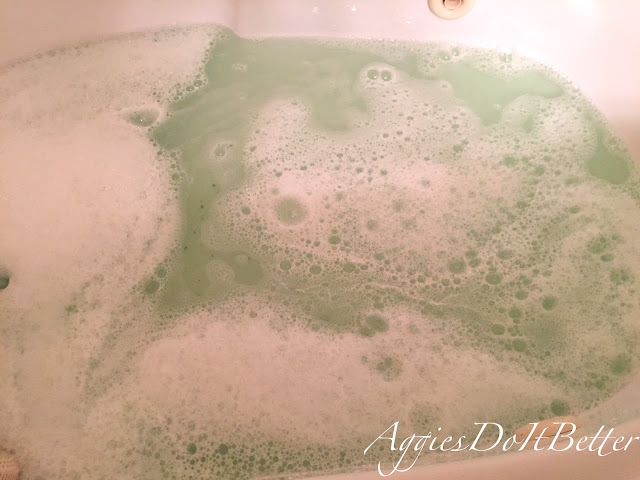 This bubble bar from Lush is called "Grass". I bought this from the Lush UK website online and since I don't go into the stores that often I'm not sure if you can buy it here in the US or not. It doesn't show up on the Lush USA app. The reason I bought it is because of my love for the Avobath bath bath bomb and new found love of all things grassy and forest scented (excluding the Tramp scent, ew) This was definitely a gamble purchasing this before I smelled it but it was so cute and I knew I could do matching nail art so I took a risk! 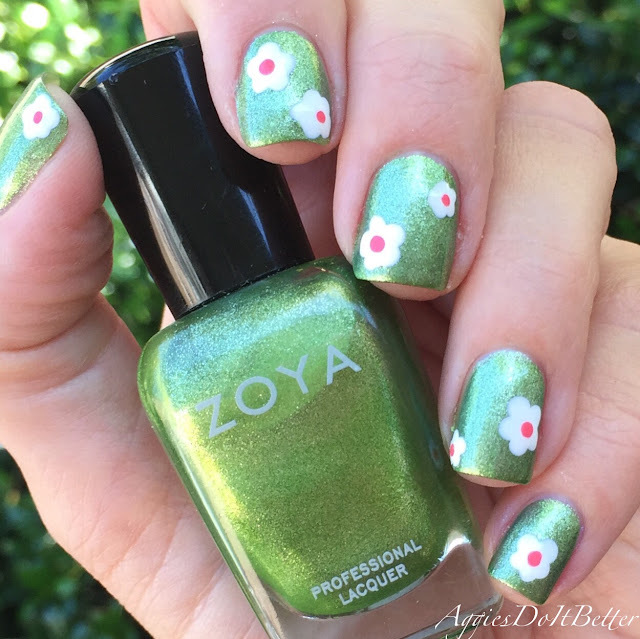 Searching for a matching green with subtle shimmer in my drawers I landed on Zoya Meg. I think it matched pretty nicely! And it's my kitty's name :) I made the flowers with Zoya Purity and Wendy. I'm very artistically challenged and even with using just a dotting tool they weren't easy to make! 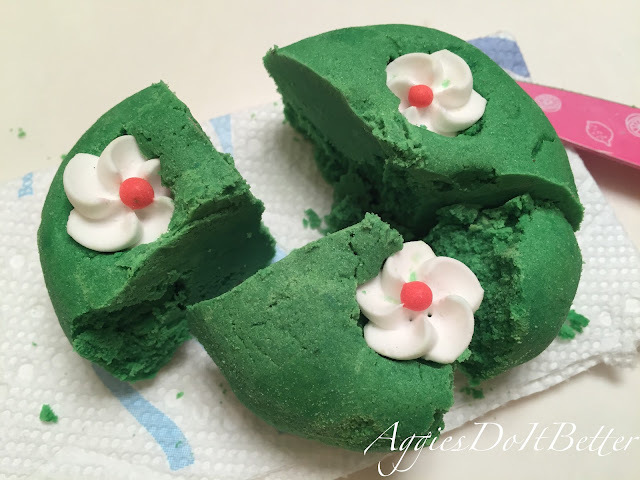 I have been finding that cutting up the Lush bubble bars into 3 or 4 chunks makes plenty enough bubbles for me. 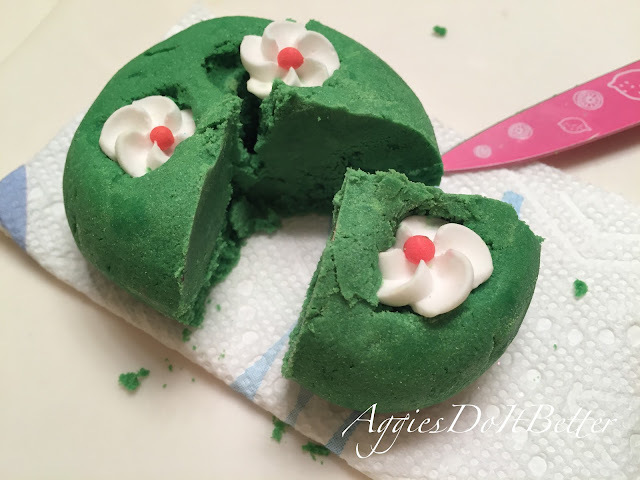 I have been using a knife to try to preserve the integrity of the bubble bar....I want it to stay together as much as possible and crumbling part of it doesn't exactly do that. Ok....on to the scent. It smells GOOD! I don't think the smell would be for everyone, but if you remember the days when Yankee Candles were *all that* and there was one called "Fresh Cut Grass" or something to that extent...I had one in my apartment in college and loved it. It was great for summer and wasn't perfumy or frostingy or laundry-y like all my other ones. And it DID smell like fresh cut grass! This bubble bar smells a lot like that. Its very "natural". Officially the main scents in it are Bergamot and Sandalwood oil. It has Limonene in it so that's a plus for me too. Look at the crazy tower of bubbles! Overall this is a definite repurchase for me! It's so cute and I love the natural grassy scent!